Ex-Starbucks CEO Howard Schultz was at the Brattle to promote his book. 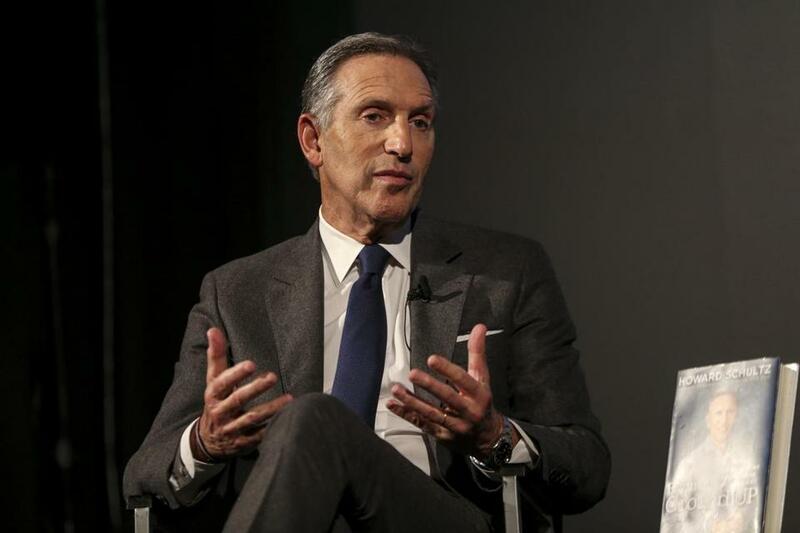 CAMBRIDGE — Howard Schultz, the billionaire former chief executive of Starbucks, defended himself Tuesday against the blistering criticism he has received from Democrats who say he will help reelect President Trump if he runs as an independent for president in 2020. Veronica Martinez, executive director of the Massachusetts Democratic Party, also blasted the prospect of an independent Schultz campaign. Schultz said he has been surprised by the “toxicity” of the blowback to his possible candidacy and called it a reflection of the fear and divisiveness in the country, which he wants to mend if he runs for the White House. “We have a void of leadership. We have a void of trust. And we have a government that’s not working for the people,” Schultz said at the Brattle, where he was interviewed by James Fallows, a national correspondent for The Atlantic magazine. Schultz, despite striking a defiant tone toward his critics, also sought to allay their concerns. “I’m not going to do anything as an American or as a candidate to reelect Donald Trump,” he said without elaborating. “I can promise you that.” The comment drew applause. Raised in the Brooklyn housing projects, he has an inspiring life story. He was the first in his family to graduate from college and helped grow Starbucks from a small Seattle-based chain with 11 stores to a global corporation with 28,000 stores and 400,000 employees in 77 countries. Along the way, he developed a reputation as a progressive business leader, giving health insurance to all employees, including part timers. He said he is interested in running for president because the two major parties have become too extreme and unwilling to compromise. Schultz did not address the spat directly on Tuesday but chose his words carefully when asked by Fallows whether he supports higher taxes on the rich. “I believe the wealthy should pay more taxes, but I think need we need transformative tax reform throughout the country,” Schultz said. Still, Malone said, he remains concerned that Schultz would help reelect Trump. “I would like to see him hugely influencing the debate so the Democrats become much more centrist,” he said. Todd Denman, a former manager at Starbucks stores in Cambridge, said he attended as a Schultz “fanboy” who admires the culture and values that he created at Starbucks. Denman said he is “still a little bit up in the air” about a Schultz campaign but was glad he said he won’t do anything to help reelect Trump. “His humility and integrity – I think that’s rare for a political campaign,” Denman said.